This is a fairly simple site -- not much customised graphics or interactivity was put into it. There's a lot of scanned images of photos taken, news clip in both text-based and scan-based formats, as well as a sound clip containing the interview done by RTM's Radio 4 with Datuk Tham Nyip Shen, Sabah's Minister of Industrial Development. 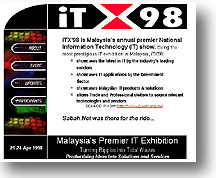 The site resides in Sabah.Net's Archives. Tools & skills used: HTML, Adobe Photoshop, Notepad.